If you are looking for a remote, peaceful and relaxing Fiji holiday experience then visit the green paradise and tranquil surroundings that the Navua River Lodge provides. The beautiful Navua Upriver Lodge was recently opened and is ready to welcome the holiday traveller who wants a different style of accommodation in the heart of Fiji. 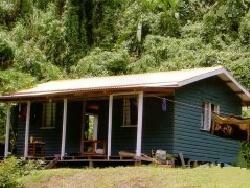 This remote property is situated about 30 kilometres inland from Navua town on a 1 ½ hour ride in a long boat. The scenic journey takes you past many beautiful waterfalls and remote villages where you will see the friendly inhabitants going about their daily routine in the beautiful Fijian highlands. The Navua Upriver Lodge allows you to just relax on the beach by the river or try the various activities on offer for your enjoyment. Alternatively you can just be at peace with nature and soak in the amazing surroundings. Some activities close to Navua Upriver Lodge include bush trekking, hand line fishing and bamboo rafting. You can even enjoy an evening kava session while listening to the local string band and a village visit can also be arranged.